An Egyptian Walking Onion topset looks like, and essentially is, a miniature onion. Topsets produced by these plants are generally smaller than the ordinary annual garden-variety onion sets. They range in size from 1/4 inch to 1 inch in diameter. Location. Plant each topset in the soil about 2 inches deep. The soil should be slightly moist and well drained. If you are planting in rows, then space the topsets about 1 foot apart, and approximately 6-10 inches apart in each row. Walking Onion sets can also be planted in clusters and they can be planted in pots to be kept outside or indoors. Plant in full sunlight, but partial shade is ok. Planting Time. They can be planted any time of the year even in the winter as long as the ground isn’t frozen or covered with snow. However, fall is the optimal time to plant them so they can develop a strong root system and be ready for good growth the following spring. Spring. This is a good time to plant the topsets. They will grow throughout the spring and summer and develop tall green leaves and bulb/root growth in the ground. Since it is the plant’s first growing season, it will probably not produce topsets. Summer. Topsets planted at this time will grow roots and leafstalks, and have some onion bulb development in the ground, but they will not produce topsets. Fall. This is the optimum time to plant topsets. When planted at this time will grow roots and leafstalks only. 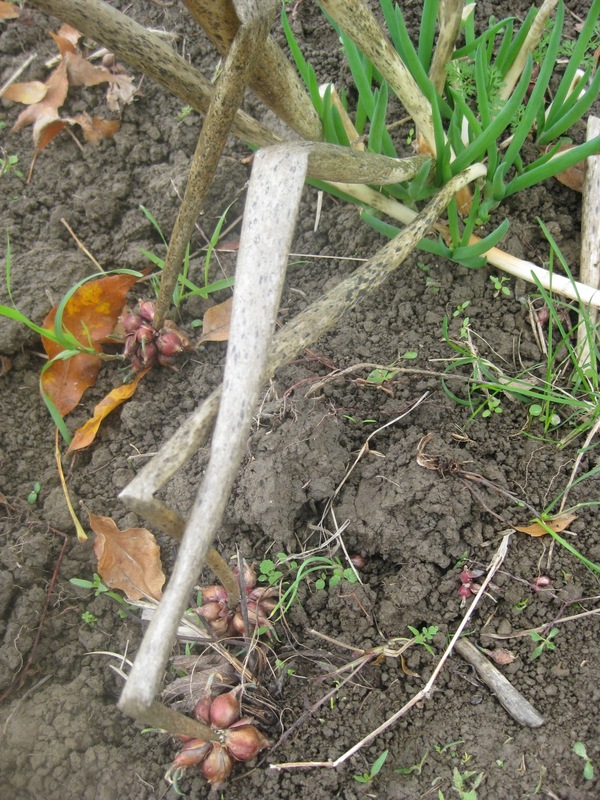 The leafstalk will die back for the winter, but the topset will develop into a small onion bulb in the ground and store enough energy to carry through the winter. Winter. As long as the soil is not frozen, you can plant the topsets. If you can dig a 2″ deep hole in the soil, then you can plant your sets. The topsets will not grow much at all, unless you live where the winters are mild. When planting in the winter, mulching is a good idea. Soil. Plant the small bulbs in soil that is well dug and amended with organic matter such as coconut coir and compost. As mentioned in my previous post, they are very hardy so should do well even in very cold climates. Growing. 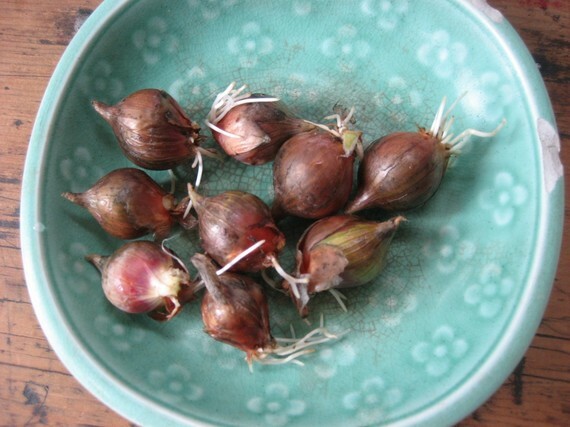 In the ground, the plant produces a small shallot-like onion, which can be harvested. Once harvested, however, the plant will obviously not grow back. If left in the ground, the onion will divide and form a cluster of onion bulbs. New leaves and topsets will grow from the onions each year. This onion is easy to propagate. Just break off the bulbils and plant. Place them no more than an inch deep and 4-5 inches apart. They can be separated, but will grow as a clump very well. They don’t need to be replanted as the similar multiplier onions do. They also multiply from the base; so established clumps can be divided as well. 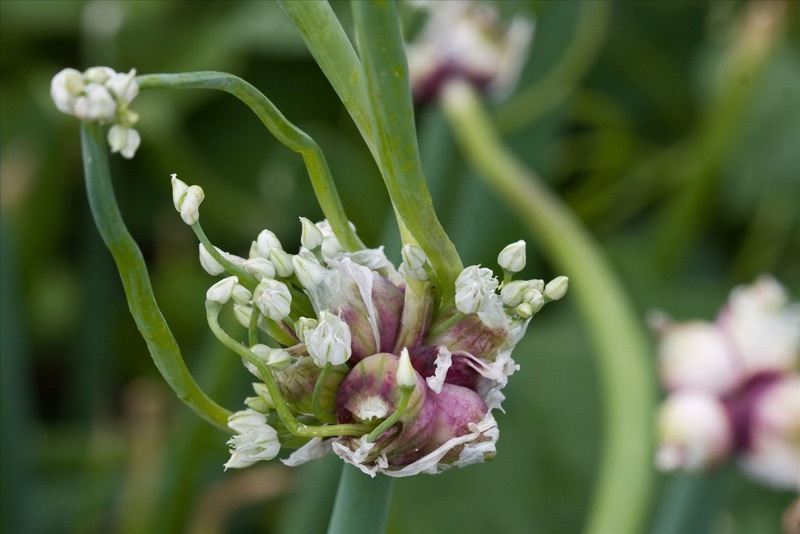 This is best done in spring, but you can also divide these clusters and plant as you would other onion sets in the autumn. Harvesting. You can dig up an entire clump or just harvest individual leaves. The small, underdeveloped onions at the bottom of the mature plant are edible, but are very hot. Most people eat the tender young shoots and stems as green onions or chives. The bulbils can be eaten, too, if not replanted. You’ll be able to dig some of the onions to use as bunching or green onions in the early spring. Topsets. In mid- to late summer and autumn the topsets may be harvested. The optimal time to pluck off the topsets is when the leafstalk has dried and turned brown. More than likely, it has fallen over by this time. Be sure to remove any topsets that have fallen to the ground if you do not want them to self-sow in their new locations. The Greens. The greens (leaves) may be cut and harvested at any time of the year. Just harvest one or two leaves from each plant. Be careful not to cut the stalk that has the topsets. 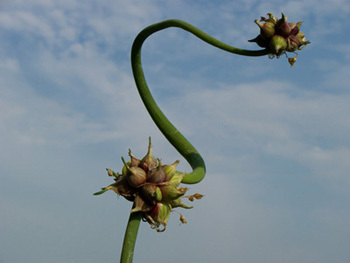 Soon after you have harvested the leaves from an Egyptian Walking Onion plant, new leaves will start to grow in their place, which can be harvested again. Base Onion bulbs. The onions at the base of the plant that are growing in the ground can be harvested in late summer and fall. Be sure to leave some onions in the ground for next year’s crop. The bulb is about the same size and shape as a shallot. Bigger bulbs may be obtained by cutting off the topsets before they develop. (Note: if you harvest the onion bulb in the ground, you will destroy the plant – it will not grow back next year. So, if you want to eat the onion bulbs in the ground, make sure to replace them by planting topsets, or offsets from the bulb divisions. Eating. This type of onion is very strong flavored, although some cultivars are relatively mild and sweet. The underground bulbs are particularly tough-skinned and pungent, and can look elongated, like leeks, or in some types may form bulbs up to 5 cm across. 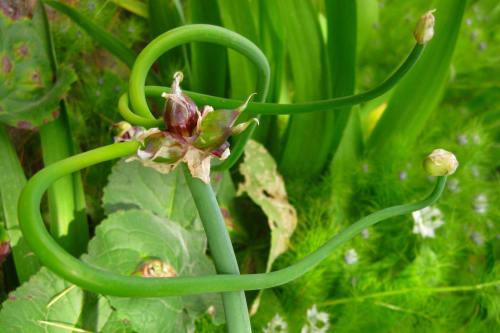 Young plants may be used as scallions in the spring, and the bulblets may be used in cooking similarly to regular onions, or preserved by pickling. I will immediately take hold of your rss as I can’t find your e-mail subscription hyperlink or newsletter service. Do you’ve any? Kindly allow me recognize in order that I could subscribe. Thanks. Hi there – I’ve placed a link on the bottom of my page and also on the individual post pages that will allow you to follow via email. I appreciate the feedback. Please let me know if that link worked for you. A little Layering Will do Just Fine, Thank You. Hummingbird nest among the lights. Nature + urban industrial design. #über_adapter #master_of_disguise.